I hope you enjoy today's legend. I'm away for a few days visiting relative in Wales, so please excuse me if you comment and I don't get back to you. I promise I will answer as soon as I am able. 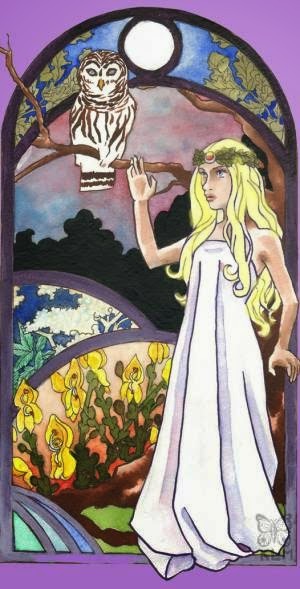 The story of Blodeuwedd (Blaw - dow- ith) is one of the legends belonging to the Mabinogion, a famous collection of old Welsh legends. A woman named Arianrhod had two sons, one whom was named Lleu Llaw Gyffes. She had a dislike for Lleu and put three curses on him: that he would not receive a name unless it was given by her, he would not receive his armour unless from her, and the last curse was that he would never be allowed to marry a mortal woman. When he grew to manhood, Lleu called upon his two uncles, who were the wizards, Gwydion and Math, to help him find a wife. With the chant "Take the flowers of the oak, and the flowers of the broom, and the flowers of the meadowsweet, from those they conjured up the fairest and most beautiful maiden anyone had ever seen.They created a wife for Lleu Llaw Gyffes out of flowers and baptized her, naming her Blodeuwedd, meaning 'flower face'. Blodeuwedd was beautiful and innocent; immediately Lleu fell in love with her and the two were married. After she had become Lleu's bride, and they had feasted, Matb said, “I will give the young man the best Cantrev to hold.The Cantrev of Dinodig.” The place was a palace in a spot called Mur y Castell,the old name for Tomen-y-Mur near Traswfynydd There Lleu and Blodeuwedd reigned, and were beloved by all. not during the day or night, neither riding nor walking, not clothed and not naked, nor by any weapon lawfully made. When Gronw and his hunting party left and Lleu returned, Blodeuwedd pretended to be worried about his safety and asked him what method could be used to kill him, He revealed that he could only be killed at dusk, wrapped in a net with one foot on a cauldron and one on a goat and with a spear forged for a year during the hours when everyone was at mass. Blodeuwedd went to Gronw Pebyr with the information and they arranged his death. Gronw Pebyr began working on a spear immediately. Exactly one year later, Blodeuwedd convinced him to demonstrate how impossible it would be for him to be in the position where he could be killed, by chance, and when he did so, her lover Goronwy leapt out and struck with the spear he had been forging for one year during the sacred times of mass. Because Lleu had one foot on the side of a metal cauldron and the other on the back of a goat, Gronw’s plan was successful. But what Lleu had not told Blodeuwedd was that he could lose his life. Instead, as soon as the spear hit him, Lleu turned into an eagle and flew away into the forest. After hearing the news, the wizard Gwydion set out to find Lleu. He found him in a tree in the forest nearby, living off the meat of a wild boar lying at the footof the tree. Because of his magic powers, Gwydion was able to turn Lleu back into a man. Lleu set out to find Gronw Pebyr and Blodeuwedd. Lleu killed Gronw Pebyr, but Blodeuwedd had run to the forest. 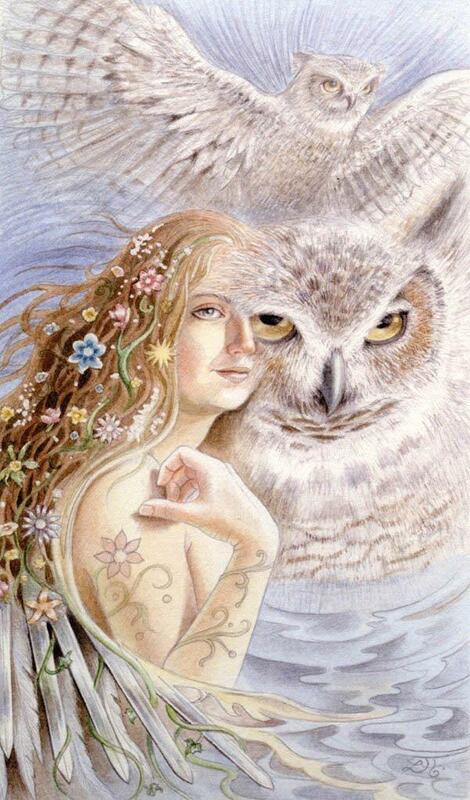 Gwydion managed to corner her and as punishment for what she had done, he turned her into a tawny owl, telling her that every other bird would fear her and thus she would have to live the rest of her life in solitude. Roman fort of Tomen y Mur was built, near Trawsfynydd.